We should begin by pointing out the distinction between radiation used in nuclear medicine/radiopharmaceuticals (more akin to the other topics of this chapter) and electromagnetic radiation (light of different wavelengths). Nuclear medicine is the branch of medicine most closely tied to the concepts of nuclear chemistry discussed in this chapter. Diagnosis via nuclear medicine typically involves the injection of a radiopharmaceutical into the body, and the radiation released by this drug can then be monitored to gain information about organ function, blood flow, the location of a tumor, or to locate a fractured bone. In some cases, the use of nuclear medicine can allow for earlier diagnosis than with other imaging techniques. In terms of using electromagnetic radiation for medical applications, perhaps one of the first treatments that come to mind is radiation therapy, which is used to fight against a broad range of cancers. This involves using focused electromagnetic radiation to damage the DNA in the tissue of a tumor while hopefully not causing too much damage to the surrounding healthy tissue. The goal is to damage the DNA of cancerous cells so that they are unable to reproduce, hopefully killing the tumor with time. Beams of radiation are focused onto the tumor from different angles to minimize the effect on any one area of healthy tissue. X-rays and CT scans are two commonly used, noninvasive medical techniques that make use of electromagnetic radiation to take pictures of what’s going on inside the human body. It should be noted that prolonged exposure to the X-rays used in these procedures can be harmful and are capable of causing cancer themselves over long periods of time. 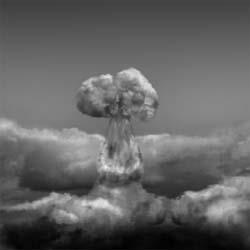 An atomic bomb blast (illustration shown here) releases huge amounts of energy by creating a fision chain reaction within the bomb.